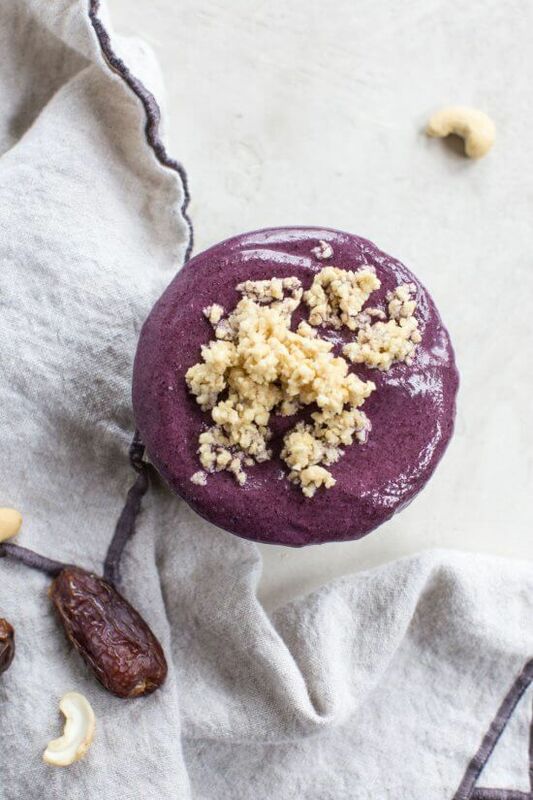 Vegan Blueberry Cheesecake Smoothie Bowl tastes like cheesecake! 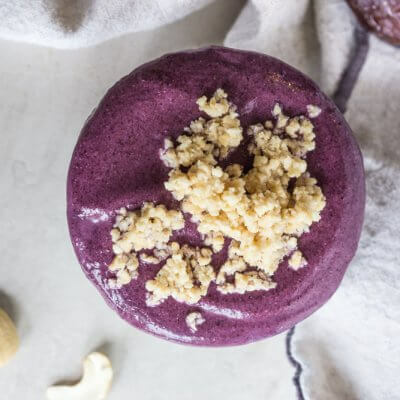 Gluten free, vegan smoothie recipe with cashews, dates, wild blueberries, and almond milk. Calling all cheesecake lovers! Who doesn’t love cheesecake? Especially in the form of a creamy breakfast bowl! I know my first order of business after talking Eric into taking me on a date night to the Cheesecake Factory is getting a slice cheesecake to go home with me. And I pretty much always choose the loaded banana nana cheesecake with lots of whipped cream. Oh my! And it never fails, I will take a bite or two off of that decadent slice of cheesecake for the next day or two which almost always means I get to eat cheesecake for breakfast. Cheesecake + Coffee = Best Day Ever! So there is good news for people like me that love cheesecake any time of day. But know that while it tastes amazing, it’s not so good for you. With this breakfast bowl recipe, you can now “healthfully” eat cheesecake for breakfast! Hallelujah! What can I put in a smoothie to thicken it? These additions make the smoothest, creamiest and thickest smoothie bowls that are perfect to eat by the spoonful – just like this breakfast bowl recipe! But the truth of the matter in getting that thick vegan smoothie bowl is two things: a high powered blender and frozen CREAMY fruit! Can you freeze a smoothie bowl? Yes! That’s the beauty of this vegan smoothie bowl, it freezes so well which is why it’s a great option for breakfast meal prep. Once all ingredients are blended, pour into ice cube trays and freeze. When you’re ready to eat, I suggest adding smoothie cubes and blend again with almond milk. Alternatively, you can freeze any leftover smoothie into ice pops. Easy breakfast meal prep that’s freezer friendly. Tasty blueberry breakfast bowl FTW! How many calories are in vegan smoothie bowls? Calories are dependent upon ingredients and this specific vegan smoothie bowl is under 500 calories. Also it’s loaded with healthy fats and naturally sweetened with dates! Because smoothie bowls are most often eaten as a meal, they tend to have a higher calorie count thanks to the nutrient dense ingredients. There are endless ingredient options when it comes to making these types of breakfast bowls healthy! I suggest focusing on whole food ingredients that encompass sources of healthy fats, protein, carbohydrates and are naturally sweetened. No matter how many calories your smoothie bowl might be, the key to a healthy one is using nutrient rich foods! I was inspired to create a recipe with wild blueberries because the Wild Blueberry Association is holding a smoothie making contest and the winner gets an all expense paid trip to the Wild Blueberry barrens in Maine near Bar Harbor!! And I’ve gotta say, this vegan smoothie bowl takes the cake! SOOOO GOOD. And while creating this recipe, I learned that wild blueberries have 2X more antioxidant value than traditional cultivated blueberries! Research is finding them to be potentially beneficial for promoting gut and brain health, diabetes, and fighting cancer! So all the more reason to make the swap to using wild blueberries in my smoothies. And if you’re looking to add them to your diet, check the freezer section of your grocery store since 99% of wild blueberries are frozen. Frozen berries are ideal for smoothies — no ice needed! Since you’ve been wanting me to make a “vegan cream cheese” smoothie with cashews again, this recipe is for you. Adding cashews make the creamiest, tastiest smoothies, and they add loads of fiber too! Grab a spoon for this vegan breakfast bowl! Wild Blueberry Smoothie Bowl tastes like legit cheesecake! 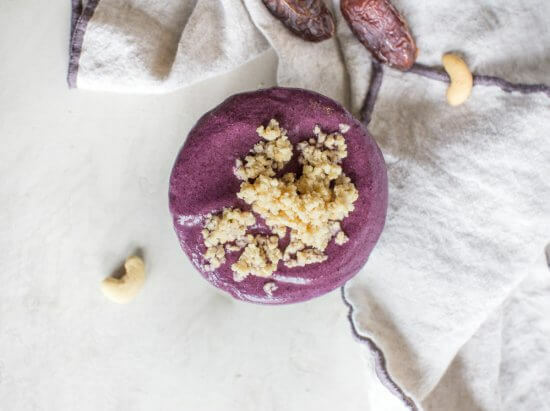 Gluten free and vegan smoothie recipe made with raw cashews, dates, wild blueberries and almond milk. Soak cashews in water for 5 minutes. Drain water from cashews and place in blender. Pulse cashews and dates in a blender until chopped. Add vanilla, wild blueberries, and almond milk and blend until smooth and creamy. Pour into a bowl and top with additional frozen wild berries and chopped cashews. 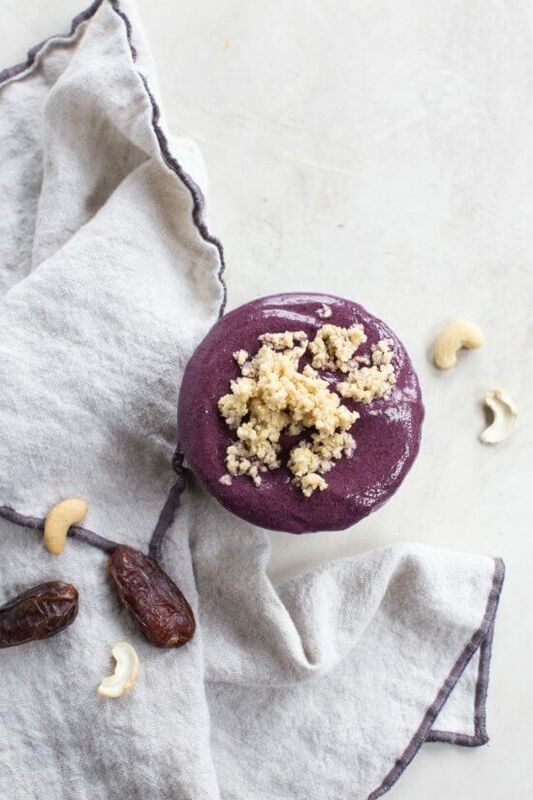 (Note: To make creamy cheesecake topping– pulse a few cashews in the blender before topping smoothie bowl). Wow, this looks and sounds incredible! I haven’t really gotten into the whole smoothie bowl craze, but I can certainly see myself happily slurping down one of these beauties. Good luck with the contest!